ANN ARBOR, Mich. — For most women, expecting a baby brings intense joy --and a fair amount of worry. Contrary to what researchers expected, a new study shows that pregnancy may actually reduce their PTSD symptoms. Or at the least, it won’t cause a flare-up. The news isn’t all good, though. More than half of the 319 women in the study had high PTSD symptoms in the first part of pregnancy – and all members of this group experienced a decrease as they got closer to giving birth. Women who had low levels of symptoms early on stayed about the same. Muzik notes that PTSD can be caused by many things – such as combat, car crashes, being robbed or raped, living through a natural disaster or house fire, or being the victim of abuse in childhood or adulthood. 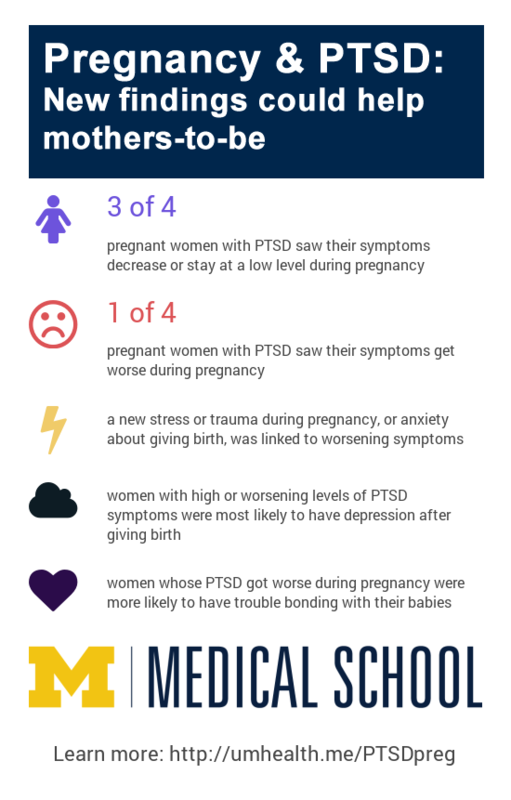 With so many possible causes, many women may not have had a formal diagnosis of PTSD before their pregnancy, but may be suffering lasting effects from their trauma. In addition to Muzik, the study team included Ellen W. McGinnis, M.S., Diana Morelen, Ph.D., Katherine L. Rosenblum, Ph.D., Israel Liberzon, M.D. and James L. Abelson, M.D., Ph.D. of the U-M Department of Psychiatry, Julia Seng, Ph.D., C.N.M., F.A.A.N. of the U-M School of Nursing and Erika Bocknek, Ph.D., L.M.F.T., of Wayne State University.